This potting mix is an amazing all-in-one organically fertilized growing medium that contains all the nutrients necessary to grow award-winning flower arrangements and vegetables. SEA SOIL™ contains all necessary micro and macro nutrients to grow a healthy garden, is weed-free, and is an excellent way to retain moisture. SEA SOIL™ is listed by the Organic Materials Review Institute (OMRI). Our mix is a precise blend of Canadian Sphagnum Peat Moss and SEA SOIL™. 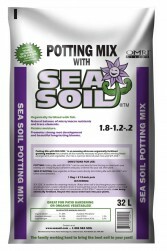 Potting Mix with SEA SOIL™ is an amazing all-in-one organically fertilized growing medium that contains all the nutrients necessary to grow award winning flower arrangements and vegetables. Our mix is a precise blend of peat moss and SEA SOIL™. POTTING: Potting Mix with SEAL SOIL can be used directly from the bag of mixed with your existing soil. Simply fill your containers and pots, or blend into your soil, then plant. SEED STARTING: Sow vegetable or flower seeds directly into Potting Mix with SEA SOIL and follow seed directions.